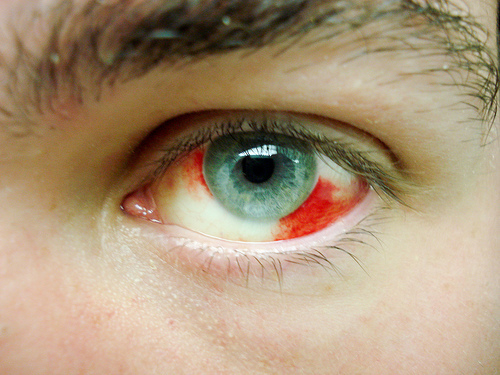 Thankfully subconjunctival hemorrhages look at lot worse than they truly are in most cases. Blood is trapped on the surface of the eye due to a broken blood vessel in the conjunctiva (the vascular tissue that overlies the white of the eye). Because the conjunctival tissue is a vascular membrane, blood that leaks gets trapped underneath and can take 1-2 weeks to fully reabsorb. coughing, sneezing, straining, heavy lifting, or vomiting These activities acutely raise blood pressure in the veins, causing a small rupture in the capillary bed where arteries and veins connect; it's called a valsalva maneuver. What Can I Do To Look Normal Again? Unfortunately subcojunctival hemorrhages will reabsorb in their own good time. 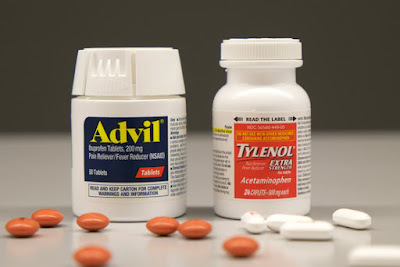 There is no eye drop or medication that can make them heal faster. Typically resolution occurs within 1-2 weeks, depending on the size of the hemorrhage. If the hemorrhage happened at the top of the eye, it may actually look worse before it gets better as gravity brings the trapped blood downwards toward the lower eyelid area. Some people report success alternating a cool and warm compress (just held over the closed eye --no rubbing). Heat can improve circulation to the area and potentially help breakdown clotted blood so it absorbs faster. Cool compresses can reduce the swelling often associated with an acute hemorrhage by constricting the conjunctiva. Even though a subconjunctival hemorrhage can be a benign finding, there are many conditions that can cause hemorrhages that deserve investigation. If you've had a recent trauma, you definitely need to see a doctor in case there is an open abrasion or maybe even a deeper injury that needs treatment. Blood pressure should be checked when a subconjunctival hemorrhage appears without history of trauma - a study of 78 patients with spontaneous presentation of subconjunctival hemorrhage (average age 53) showed that 46% of patients with subconjunctival hemorrhage had elevated blood pressure. If you have recurrent subconjunctival hemorrhages, having blood work done to test for dangerous systemic conditions is a good idea. In addition to checking blood pressure and blood sugar, your doctor may order blood work to rule out anemia, leukemia, and blood clotting disorders like polycythemia. Most of the time subconjunctival hemorrhages are just an annoyance, but they can be a sign of a deeper health problem that is just expressing itself through the eyes. This is a wonderful guide for people suffering from subconjunctival hemorrhages. Over the years, I have had many and most recently several in succession. 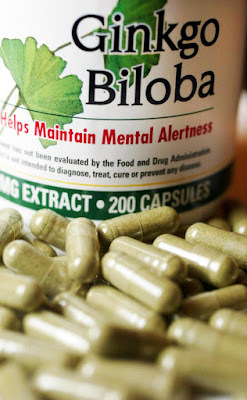 I realized however, that I’ve been taking a combination of ginkgo biloba, bilberry extract and omega-3 which in combination may have played a significant role. I plan to begin a daily regimen of vitamin C, bioflavonoids, grapeseed extract and papaya leaf extract to assist in capillary wall support and platelet reproduction. I hope to hear about others who have experienced similar conditions. I suddenly suffered from subconjunctival hemorrhages today and was trying to recall whether I've had any trauma or any illnesses. Other than stress; I realised I had started taking Bilberry a day ago..... Could this be the reason? This could be a very serious medical emergency! Got to the emergency room immediately!